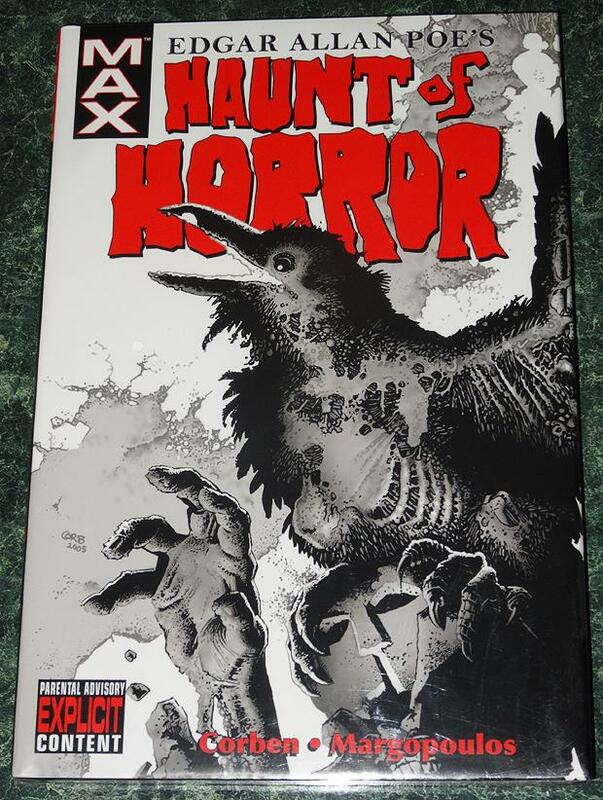 New copy of Edgar Allan Poe's Haunt of Horror (Hardcover) from Marvel Comics. US$16.90 which includes shipping with USPS Media Mail within the continental United States. Orders placed before 4PM EST ship same-day. Published: October 9, 2006, Original Cover Price: $19.99 1st printing. What scares you? Serial killers? Vampires? Earthquakes? Extreme sports? The dentist? Horror-comics legend Richard Corben (Creepy, Eerie) and longtime collaborator Rich Margopoulos leave no gravestone unturned as they offer up wicked spins on the classic poems of Edgar Allan Poe. Each adaptation is hauntingly rendered in black and white with gray tones as only Corben can do it - along with the full text of Poe's poem for comparison. Collects Haunt of Horror #1-3 and extras. Hardcover, 112 pages, full color. Cover price $19.99. This item is brand new and factory sealed in plastic.